Udupi, July 10, 2016: Vishwesha Tirtha Swami of Paryaya Pejawar Mutt will be giving “sanyasa deekshe” (initiation to monastic order) to Bharath Raje Urs (34), here on July 11. 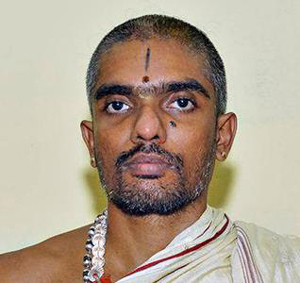 He will then be nominated as the first “peethadhipati” or seer of the Sri Rajarajeshwari Samasthana Kshatriya Peetha. The rituals will be held at the Sri Krishna Mutt/Temple from Saturday to July 11. The main ceremony will be held on July 11. Son of Hemaraje Urs and S.P. Jyothi, he completed his engineering degree in Electronics and Communications from Manipal Institute of Technology (MIT), here in 2000. A bachelor, he studied “shastras” at Shrimat Bhagavatha Vidyapeetha at Mathura and then served for eight years at International Society for Krishna Consciousness (ISKCON). He has been studying “shastras” here. He also served as the convener of the conference on cows (“go-sammelan”) held here last year, the release added.